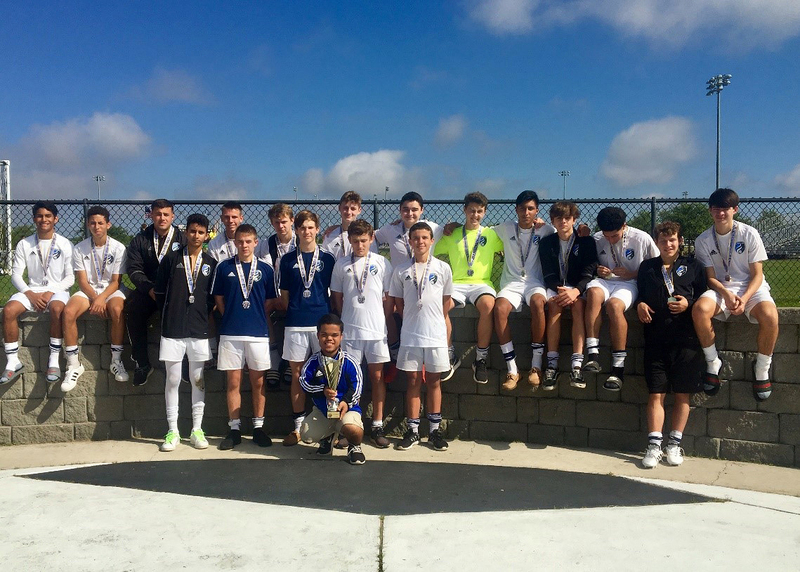 On Saturday, March 17, West Florida Flames U17 Boys Premier team found themselves competing in the semi-finals of the Region C Commissioners Cup once again for the second year in a row. This time the outcome was a spectacular 4-1 win over the St. Pete Raiders with goals from Eli Davila, Alan Gordon, Jacob Georggi, and EJ Weir and Mark McGinnis in the net sending them to the Championship game for the Region C Commissioner’s Cup. On Sunday, March 18, the Flames team took the field against Team Fusion in the Final game. In the first half, the Flames found themselves down 0-1 after Fusion scored a lucky goal. After the half time break, the Flames came back on the field with a new-found energy and Tyler Van Dorn, a Defender, scored an amazing goal tying the game 1-1. The positive momentum for the Flames produced a second goal scored by Alan Gordon putting the team ahead 2-1. With some great saves by Goalkeeper, Mark McGinnis, the Flames were able to lock down their defense and hold strong for the remainder of the game resulting in a 2-1 win over Fusion awarding them the Championship. In the past year, under the leadership of Coach John Van der Luit, this team has played in six Finals and won four Championships at various tournaments bringing the team’s ranking to #30 in the State. The Flames will play their next game in Auburndale on April 21st against the other Region winners for the Commissioner’s Cup State Title. Congratulations to this team for all their success and best of luck for the State title! West Florida Flames U17 Boys Premier Team pictured from left to right, Front row: Jacob Georggi, Matthew Fetterhoff, Matthew Ritari, Coach Issac Carriso, Zachary Paynter, Antonio Quintero; Back Row: Johndel German, Carlos “Eli” Davila, Coach John Van der Luit, Michael Bradford, Sean Rummery, Luke Laliberte, Alan Gordon, Mark McGinnis, Miguel Soto, Tyler Van Dorn, Matthew Astacio, Jake Johnson and EJ Weir. Not Pictured: Rizah Mahmuti.